Donovan Arborists specializes in the landscape maintenance of small, upscale HOA properties in the Denver area. We offer a complete package that cares for the trees, shrubs, turf and snow removal. 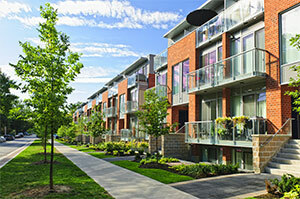 We make it easy for property managers that want one company to provide all of these services. Donovan Arborists will develop a management plan for the trees and shrubs on the property. This plan will include tree and shrub pruning, Insect and Disease Management, Deep Root Watering and Fertilization. We can also remove trees and shrubs and replace them with new plants that will thrive in your location. Donovan Arborists uses a combination of sound cultural practices and organic based products to keep your turf healthy. Our lawn programs include Aeration, Mowing, Fertilization and Weed and Insect Control. Snow removal is an important part of any landscape maintenance program. Snow and ice can present a dangerous situation if not removed quickly. You can count on us to make sure your sidewalks and driveways are clear of snow and ice. Annual contracts are required to maintain HOA Properties. We limit the number of properties we work on so that each property gets the attention it deserves. We take pride in providing the best landscape maintenance for upscale properties in the Denver Area.